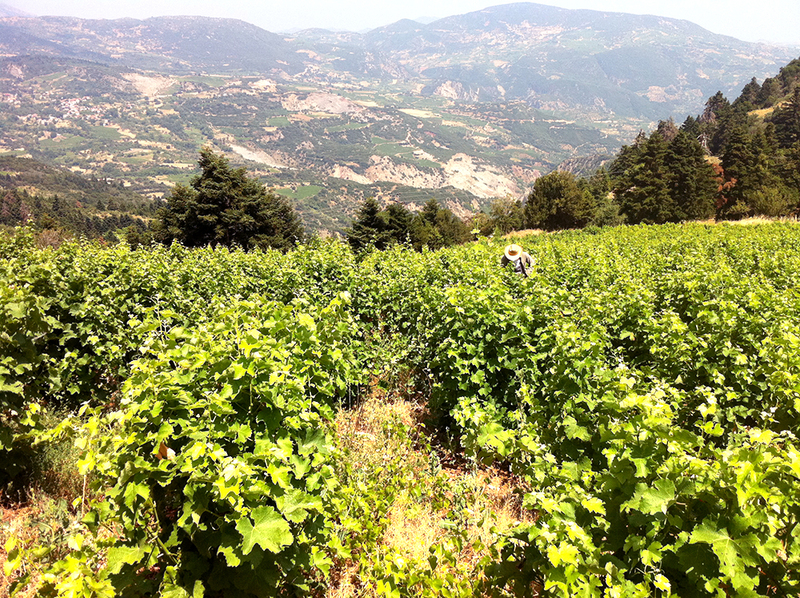 Nesson area which is located 15 km from Larissa at an altitude of 250 m, was the site of Noulas’ family vineyards. They originally planted the local varieties of Batiki (white) and Muscat (red) which were traditionally vinified. The vinification of these varieties have not produced the expected results due to clonal selection and vine viruses that have degraded the quality of the final wine. Truly exceptional vineyards especially in spring when the almond trees blossom, provide a breathtaking view. The local soils are mainly sandy (75%) with a small proportion of clay (25%). The organic matter content does not exceed 1%. It has a North – South exposure with a Vertical Shoot Positioning (VSP) system Guyot trained with medium shoot density and satisfying the expected inner-canopy shading and accommodate the right leaf surface area exposure. The height is set to 60 cm from the ground and the leaf surface area to ​​100-110 m high. In the mountain region of Aigialeia, at an altitude of 950 m, lies the vineyard for the Chardonnay. The soil is sandy with pebbles and clay. 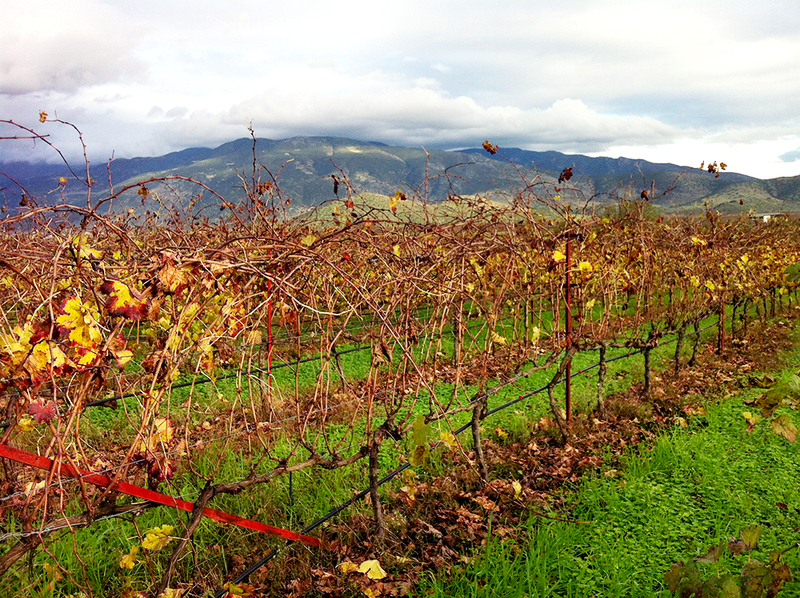 North-South exposure, Gobolet (bush) trained vines. The extreme temperature difference between day and night supports the preservation of the varietal aromatic precursors. The Atalanti clay loamy soil favors Cabernet Sauvignon. The grapes ripen evenly while maintaining their acidity. Evaluation of grapes’ pH level and other parameters through time supports the vintage date decision for preserving the aromatic characteristics of the final wine. In Leontion, situated at the periphery of the Nemea wine region, our Agiorgitiko is planted in pebble soil (35%) with clay and an altitude of 450 m. The cool winds during the ripening period of the grape provide favorable conditions for the development of the aromatic profile as well as the tannic structure of the final wine. Aiming at the highest grape quality we apply Organic Viticulture Practices to all our vineyard sites. Parameters like site aeration, clone selection, intensive vineyard scouting and canopy management are of major importance for efficient application of organic management techniques. Currently, copper and sulfur fungicides are the only means applied to satisfactory control of diseases like powdery and downy mildew. c) when the shoot reaches a height of 15 cm. 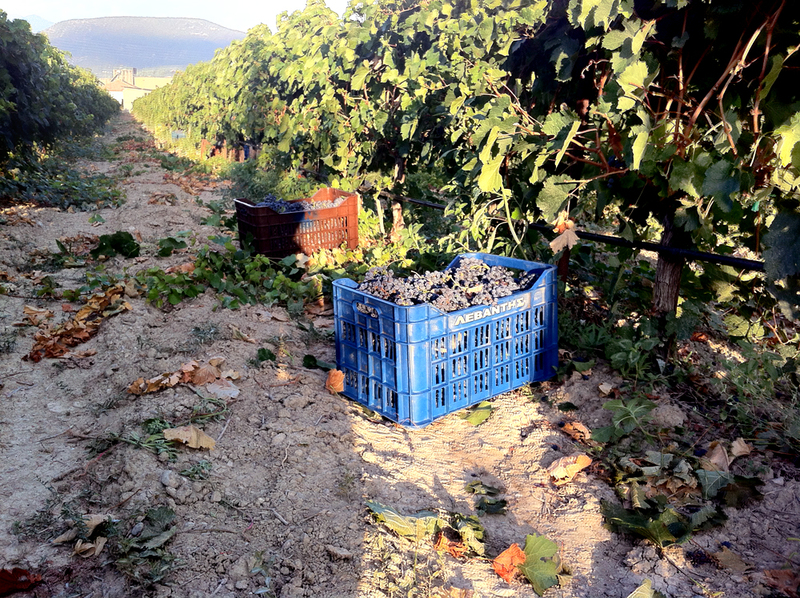 Then we continue with dusting sulfur mixed with bentonite from blossom until grapes’ veraison.